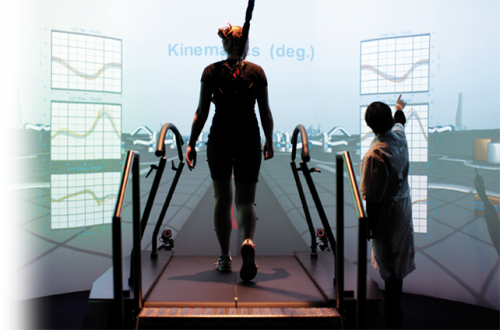 The ORI Gait Lab is a world-class facility utilising the GRAIL system (Gait Real Time Analysis Interactive Lab). 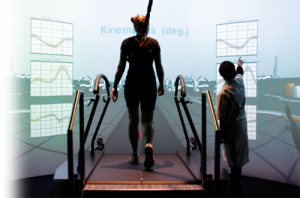 The system integrates an instrumented dual‐belt treadmill, Vicon motion‐capture system and synchronized virtual reality (VR) environment next to three video cameras and electromyography. This is the best available equipment on the market and one of only a limited number of GRAIL systems in the world. ORI also has a fully equipped biomechanics lab with state-of-the-art equipment such as the PrimusRS for muscle testing. At ORI we use the gait analysis equipment to monitor patient outcomes after surgery. It is a unique selling point that, combined with a proven 10-year track record of industry research, high volumes of surgery, and excellent clinical outcomes, makes ORI such an attractive partner for international orthopaedic multinationals.